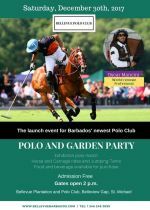 You are invited to the Official Launch of the Bellevue Polo Club with Polo and Garden Party at Bellevue Plantation House. Come see world renown player Oscar Mancini in an Exhibition Polo Match. Horse and carriage rides for the family. Food and drinks on sale.